It goes without saying that bright, white teeth do a great deal for your appearance but they can do a great deal for your self-confidence too. After far too many years of drinking black coffee, it is a subject close to my heart and we have already looked at other ways to brighten your teeth like baking soda which I have found to be very effective. When we think of essential oils, we usually think of their uses in aromatherapy and massage but many essential oils are also good for oral health. Clove, lemon and peppermint essential oils are just a few that spring to mind. They have excellent antibacterial qualities and are commonly used to make a mouthwash to keep infection at bay. But what about whitening your teeth? Can essential oils really help bring the brightness back? The answer appears to be yes. There are several essential oils that can be used as an ingredient in a convenient and easy to make tooth whitening mixture. Before we go any further, I would like to point out that swallowing essential oils can be extremely dangerous. These volatile oils are highly potent and can cause a number of side effects when they are not used properly. While some essential oils are much stronger than others, it is good practice to avoid taking essential oils internally unless you are under expert supervision. Simply using a natural remedy to whiten your teeth is unlikely to have much of an impact unless you also commit certain other lifestyle changes. This is especially the case if you are a smoker or you drink a lot of staining drinks like coffee or soda. Genetics : Unfortunately, some people are more prone to yellow teeth than other people because of genetic factors. Certain Drinks : Many drinks can lead to your teeth becoming yellow when you consume them over time. Coffee is a huge culprit and so are dark colored sodas. Black tea may be more healthy than your cup of dark black joe but it can still have a staing effect on your teeth. Certain Food : many types of food can cause the enamel on your teeth to break down over time. This uncovers the yellow color beneath the enamel. Smoking : Nothing causes your teeth to become yellow and stained quite as badly as smoking or chewing tobacco. If you needed more motivation to kick the habit, this is another. Certain medications : A number of prescription drugs can cause your teeth to become discolored. These include antihistamines, blood pressure medication, antipsychotics and certain antibiotiics. There are various dental procedures to help bring the brightness back to your smile as well as various whitening products that you can buy from your local pharmacy. Dental procedures tend to be very expensive so I am glad to tell you that there are plenty of safe and natural options available to you. Apart from taking preventive measures, some of the best natural treatments for whiter teeth include strawberries, apple cider vinegar and baking soda. But this article will focus on the best essential oils to use to clean your teeth and recover that sparkling smile. We will take a look at some of the best essential oils for the purpose and let you know how to use them. Anybody that has had a look around our site knows that we are big fans of the healing powers of essential oil. It is an old cliché but there really is an essential oil for everything. Whether you are looking to treat aching muscles and sore joints, ease congestion or take care of your skin, there is an essential oil waiting for you. Oral health in general and tooth whitening are no exceptions. Certain essential oils can help you achieve whiter, more beautiful teeth because they contain powerful, natural plant chemicals powerful enough to eradicate the nasty stains. Some contain compounds like limonene which is a natural whitening agent for the teeth and also the skin. While this article is focused on teeth whitening, it is worth noting that essential oils can also improve general oral health because of their excellent antibacterial properties. They can help to fight gum or tooth infections as well as canker sores and keep your breath smelling fresh and healthy. What are the Best Essential Oils to Whiten your Teeth? While the list of essential oils known for their teeth whitening qualities is not as long as the list for many other conditions, there are still several oils that can do an effective job. There may well be more but we think the following 4 oils are the best essential oils to get rid of those yellow stains and brighten your smile. If you are unfamiliar with essential oils, they are powerful plant extracts derived from various parts of plants including tree bark, leaves, flowers, fruit rind and resins. Essential oils are very highly concentrates and contain a number of chemical compounds with a wide range of therapeutic properties. You may well have heard that there is an essential oil for everything and this is not far from the truth. They are used for a wide range of internal complaints as well as skin and hair conditions and emotional disorders like stress and anxiety. Unsurprisingly, they may also help to lighten your teeth naturally and at far less cost than an expensive dental treatment. Essential oils may help whiten your teeth because the chemicals contained in certain oils are sufficiently powerful to remove nasty stains on the teeth, Some essential oils contain compounds like limonene which is a natural whitening agent that can work on both the skin and the teeth. As well as lightening your teeth, many essential oils have powerful antibacterial properties that make them a good, natural choice for preventing tooth decay or gum infection and they can even help leave your breath smelling better for longer. There are plenty of ways that you can use your essential oils to brighten your teeth. We will start by looking at a few very easy ways and then go on to look at some tooth whitening recipes. 1) Add to Toothpaste : Simply put your regular toothpaste on the brush and add just one drop of lemon or orange essential oil. Brush as normal. 2) Mouthwash for Brighter Teeth : Add 4 or 5 drops of your chosen essential oil to a cup of clean, warm water. You can also add two teaspoons of xylitol to the mix. Mix the ingredients well and use it as a mouthwash following a meal. 3) Baking Soda and Essential Oil : Add a drop of lemon or orange essential oil to a teaspoon of your baking soda. Mix it into a smooth paste and brush as normal. 4) Honey and Essential Oil Rub : Add one drop of peppermint or wintergreen essential oil to half a teaspoon of honey. Rub the mixture into your teeth and leave on for a few minutes before rinsing it away. Some of these recipes may wear down the enamel on your teeth because of their abrasive nature. However, research suggests that baking soda is nowhere near as abrasive as was once thought. To stay on the safe side, do not overuse these recipes. Limit yourself to once every few days and you should still notice a positive improvement. 1 drop of lemon or sweet orange essential oil. Water and a small cap or dish. Mix all your ingredients in a dish or cap into a nice smooth paste. Dip your toothbrush in the paste and brush into your teeth. Leave it work for 2 or 3 minutes then rinse your mouth out well. Mix all your ingredients together. Apply the paste to your toothbrush and onto your teeth. Let the treatment work for a few minute then rinse and brush as normal. Make sure that you do not swallow any of the essential oil and rinse out your mouth thoroughly after use. 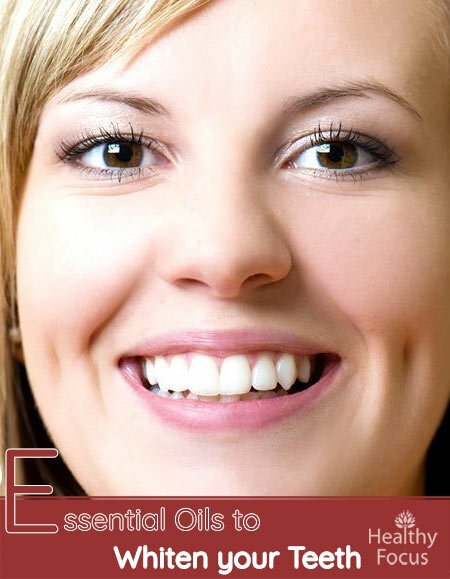 Which essential oil is best for teeth whitening? The best essential oils to use to remove stains and whiten your teeth are lemon, sweet orange and peppermint essential oils. Wintergreen is another less popular but effective option. Do not expect instant results. It can take a very long time for essential oils to have a noticeable impact on the color and brightness of your teeth especially if your teeth are badly stained. When it comes to oral hygiene, there are a number of other excellent essential oils that you can use in a mouthwash. Clove, myrrh and tea tree essential oils all have excellent antibacterial properties and can help protect against infection and tooth decay. How can I naturally whiten my teeth? There are a number of home remedies that may help whiten your teeth and remove those stubborn stains. Some of the most effective home remedies include hydrogen peroxide, baking soda with lemon juice, strawberries, apple cider vinegar and the essential oils already covered in this article. Can oil pulling whiten teeth? Oil pulling basically involves swishing a teaspoon of edible oil like coconut oil around in your mouth. Proponents of oil pulling claim that it has a number of oral health benefits like preventing cavities, removing plaque and boosting gum health. However, when it comes to whitening the teeth, it is unlikely that oil pulling will have the desired effect. Most everyone wants whiter and brighter teeth and the number of people getting dental treatments to brighten their smile is on the increase. There are several possible home remedies that may be effective in removing stains and helping you achieve a whiter, brighter smile. Certain essential oils have various oral health uses. Their antimicrobial and anti-inflammatory properties can help protect against tooth infection and help improve the health of your gums. Some essential oils may even help brighten your teeth. The most popular and effective for tooth whitening are lemon, sweet orange and peppermint essential oils. There are several ways to use these oils. They can be added to your toothpaste, combined with coconut oil or mixed with baking soda. It may take a long time before you see the desired results so stick at it. Essential oils are very powerful so be careful not to swallow any of the oil. Do you find essential oils a useful tooth whitening treatment? Tell us about your experiences and whether you have any favorite recipes that we can add to our list.